Fifteen categories of responses were offered by at least 2 percent of respondents. 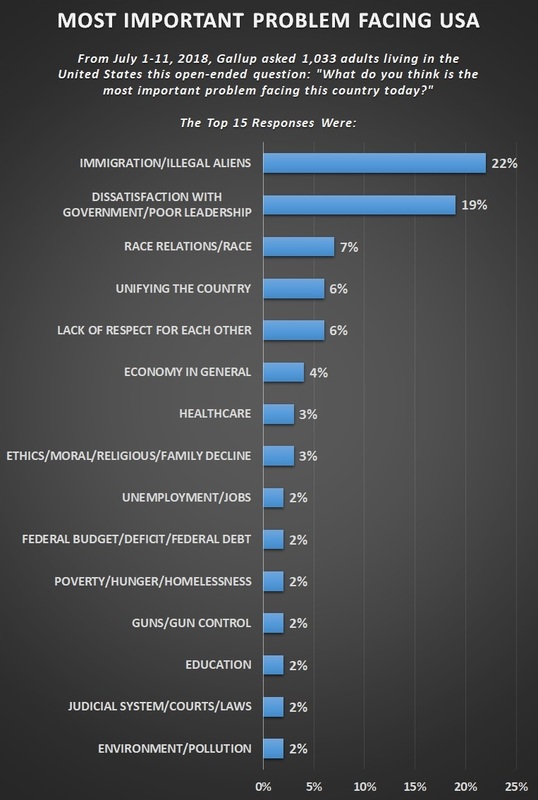 These were: “Immigration/illegal aliens” (22 percent); “Dissatisfaction with government/Poor leadership” (19 percent); “Race relations/Racism” (7 percent); “Unifying the country” (6 percent); “Lack of respect for each other (6 percent); “Economy in general (4 percent); “Ethics/moral/religious/family decline (3 percent); “Healthcare” (3 percent); “Poverty/Hunger/Homelessness (2 percent); “Guns/Gun control” (2 percent); “Education” (2 percent); “Judicial system/Courts/Laws” (2 percent); “Environment/Pollution” (2 percent); Unemployment/Jobs (2 percent); “Federal Budget deficit/Federal debt” (2 percent). Newport noted in his analysis that the previous high of 19 percent citing immigration as the most important problem occurred in 2006 when Congress was debating a major immigration bill. “Immigration reached 19 percent of mentions as the top problem facing the nation in April 2006, as Congress was wrestling with the effort to pass a comprehensive immigration bill and as immigration protests in cities across the country dominated news coverage,” Newport said. In April 2004, according to Gallup, only 2 percent had considered “immigration/illegal aliens” the nation’s most important problem. That month, the top response for most important problem was the “situation in Iraq/Fear of war,” which was named by 26 percent of respondents.